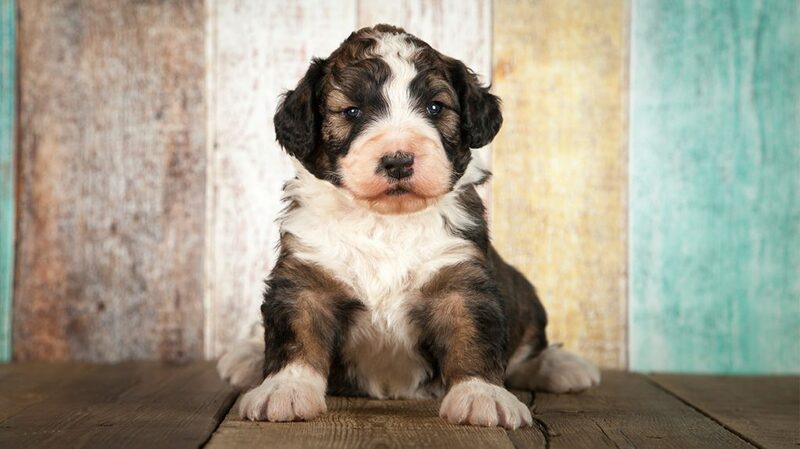 Are you enchanted by the thought of a Bernedoodle, a Bernese Mountain Dog Poodle mix? Then you’ll want to know more about this beautiful dog! The Bernedoodle is a mix of the Bernese Mountain Dog and the Standard Poodle. They range hugely in height and weight, from 15 to 27.5 inches and 40 to 115 lbs, depending upon which parent they take after. But, as a first-generation mixed breed, you may encounter some controversy about them. Purebred pups are a known quantity. They have pedigrees that document exactly who their parents are and what traits they are likely to inherit. Breeding purebreds with good health and desirable personality traits can reduce the risk of inherited problems, both in terms of health and temperament. However, breeding dogs that are too similar genetically can lead to problems. Inherited problems can then be magnified in the next generation of purebreds. That’s why responsible breeding is so important. Good breeders will use pedigree information to introduce diversity into the breed’s gene pool. Designer dogs, like the Bernese Mountain Doodle, are first generation crosses between two purebred dogs. That means they’re half one breed, half another. Purists would say that any hybrid mix is a “mutt,” even if it has been carefully bred for certain traits. Yet it is worth noting that many of our pure breeds would not exist today if it weren’t for past interbreeding. Not only that, but some breeds may need help in the future to survive. For a more in-depth investigation into this subject, visit this article. If you would like to know more about the science of crossing genetic populations and how they affect the health of dog breeds, you may wish to read this. Ultimately, though, the important thing is that we take good care of our dogs. Regardless of whether they are first generation crosses, purebreds, or garden variety mutts! It’s hard to pinpoint the origins of designer dog breeds, and the Bernedoodle is no exception. The speculation is that the Bernese Mountain Dog was originally crossed with a Standard Poodle to take advantage of the supposedly “hypoallergenic” qualities of poodles. We’ll talk about that later, but for now, let’s just point out that a mixed dog could have any qualities of either parent, and possibly none of the qualities you want. It’s totally unpredictable which attributes will get passed down. If you get a cross bred dog of any kind, you need to expect that. Bernese Mountain Dogs hail from the agricultural region of Bern in the country of Switzerland, although their ancestors were probably brought by invading Roman soldiers. These working dogs were used to drive cattle and guard farmyards. They’re excellent drafting dogs because they can pull several times their own weight. The breed began to decline in the 1800s, so the first Swiss breed club was created to help them recover. Bernese Mountain Dogs first arrived in the U.S. in 1926, when a Kansas farmer imported two of them. The AKC began registering them in 1937. These dogs are tricolored, with any combination of colors using black, tan or rust, and white. Their coats are long and silky. Males and females can be easily distinguished on sight. You probably associate the poodle with France, but they may actually originate in Germany. There, they were bred hundreds of years ago as retrieving water dogs. In France, they’re actually called Caniche, or “duck dog.” Poodles are great swimmers. That iconic Poodle show coat actually started off with a very utilitarian purpose. The Poodle clip protects chest, hip, and leg joints from cold with tufts called pompons, while providing freedom of movement for retrieving. This curly-coated dog soon found favor among the nobles of France and Europe, including the court of Louis XVI. The dog’s attractiveness and trainability made it a common sight in theatrical performances as well, and a sharp nose turned the poodle into a truffle hunter. Today, the Poodle is the national dog of France. There are currently three varieties – Standard, Miniature, and Toy. Standard Poodles come in many different colors. Interestingly, they are the only dog classified as non-Sporting that are allowed to take the AKC Retriever Hunting Tests. Although it’s hard to say what a Bernedoodle pup may look like, since it can take after either parent, you may get a pup with a large, stocky head like a Bernese. They may come in solid colors, two colors, or three colors, to create a long, curly-haired tri color Bernedoodle. Beyond that, it’s hard to know. Any attribute from either side of the family can show up in a standard Bernedoodle combination. Bernese Mountain Dogs stand 23-27.5 inches. They appear somewhat squared-off, but are slightly longer than they are tall, with full bodies and sturdy bones. These dogs may weigh between 70-115 lbs, with females falling into the lower end of the range. Standard Poodles stand at least 15 inches in height at the withers. They can weigh between 40-70 lbs, with females falling between 40-50 lbs and males in the 60-70 lbs range, which makes them a medium-to-large dog. If you want a Bernese Poodle, you will need to make sure you can handle that kind of size and weight, since full grown Bernedoodle size will likely be big. Is The Bernedoodle Dog Hypoallergenic? There’s no such thing as a hypoallergenic dog. Studies show that having a dog considered to be hypoallergenic, including the Poodle, doesn’t actually make a difference in the levels of allergens in your home compared to other dogs. Poodles don’t shed much, and Bernese Mountain Dogs shed more than some breeds. But do Bernedoodles shed? They may shed less than Bernese Mountain Dogs, but more than Poodles. Bernese Mountain Dogs are gentle giants. They are strong, friendly, and good-natured. Poodles are all-around active athletes. They are eager, intelligent, and elegant, with an upright carriage and an air of distinction. The resulting Bernedoodle temperament can make for a great, loving dog. A Bernese Mountain Dog and Poodle adult may be a great retriever, wonderful with children, and a good guard dog. It all depends on which genes get passed down from the parents! It’s very likely that the coat of your Bernese Mountain Dog X Poodle cross will be long and somewhat curly. Bernese Mountain Dogs shed quite a bit, especially during the twice-a-year shedding season. Poodles don’t shed much, but do have long hair that requires a lot of grooming. You’ll have to brush your Bernedoodle completely to the skin daily to remove loose hair and keep it untangled. Otherwise, mats can form. It may be easier to have a professional trim your Bernedoodle every 4-6 weeks, instead. Make sure to keep nails short, and be careful of diet. Both dogs can be prone to obesity, so you must strictly monitor their intake of treats. Yes, a Bernese Mountain Dog Doodle is a mix, but that doesn’t mean it will avoid the inherited problems purebreds suffer. When you’re shopping for a Bernedoodle, you must find out the health history of the parent dogs to make sure you know what might be coming. Here are some things you should watch for. These big dogs are prone to allergies, autoimmune diseases, bloat, and certain types of inherited cancers. These include histiocytic sarcoma, hemanglosarcoma, lymphoma, and mast cell tumors. They are vulnerable to degenerative myelopathy, or rear end paralysis, and panosteitis, a disease of the long bones in the legs. They may get hypothyroidism, a disease of the cartilage called osteochondritis dissecans, or Von Willebrand’s disease, a bleeding disorder. Sub-aortic stenosis is a partial obstruction affecting blood flow on the left side of the heart that sometimes shows up in these dogs, too. Bernese Mountain Dogs get cataracts, plus entropion and ectropion – conditions that affect the way eyelids turn. Also, progressive retinal atrophy can cause blindness. They can get diarrhea and digestive tract issues such as colitis (inflammation of the large intestine), inflammatory bowel disease, and irritable bowel syndrome. Some studies show an inherited tendency to B. burgdorferi infections, which cause kidney inflammation. Like all large breed dogs, they are at risk for hip and elbow dysplasia – painful and degenerative abnormalities to the joints. Their life expectancy is about 7-10 years. Poodles are at risk for autoimmune disorders such as Addison’s disease and sebaceous adenitis, an inflammatory disease that affects hair follicles. They are also predisposed to epilepsy, and have an elevated risk of diabetes mellitius and Legg-Calve-Perthes disease, a bone disorder affecting the hips. Also, they may suffer from patellar luxation, chronic active hepatitis, atrial septal defect, and polymicrogyria. Eye disorders found in poodles include optic nerve hypoplasia, micropapillae, and juvenile cataracts. Poodles have a lifespan of 10-18 years. Thus, the Bernedoodle lifespan is likely to fall between the two breeds. Both breeds are easy to train and affectionate. Poodles are high energy, active dogs that like to be kept busy. They love water, fetching, and long walks. They are graceful, agile creatures, so they excel in many different activities. Consistency is good for them. Bernese Mountain dogs are powerfully built and always up for playtime. They need a moderate amount of exercise and like being outside, and they are great at tracking and herding. These dogs don’t like being alone, though, so training is good for them. Also, they do not respond well to harsher methods, as they are somewhat sensitive. They absolutely can be. Bernese Mountain Dogs in particular are known for their gentleness with children, while Poodles, as the seventh most popular family dog in the U.S., are an all-around good choice. Just make sure to meet their training and socialization requirements, and you’ll have a happy dog that’s perfect for your home. You can locate Bernedoodle breeders online, or tap into local networks to find a Bernese Mountain Dog and Poodle Mix. 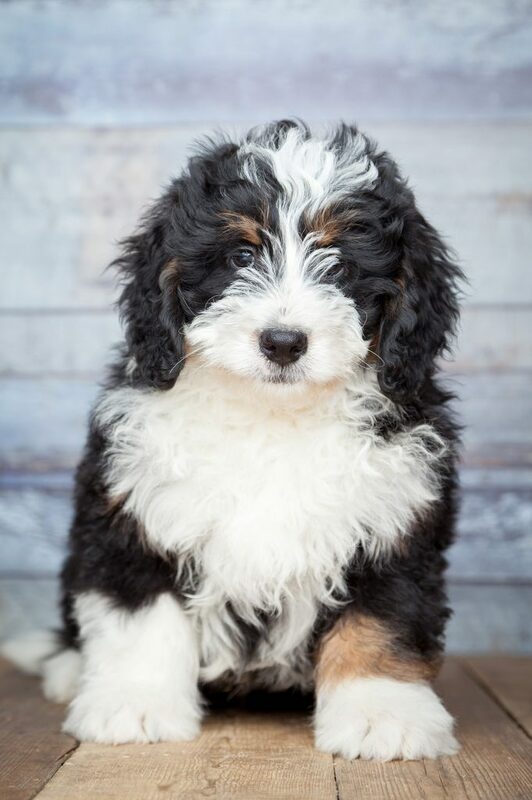 You may even be able to find a Bernedoodle rescue where you can complete a Bernedoodle adoption. A Bernedoodle full grown may be an option. Sometimes, an f1b Bernedoodle may be available. Once you find a breeder, you’ll need to visit to see for yourself the conditions of the dogs and their home. Ask questions, meet your potential Bernese Mountain Dog Poodle puppy’s parents, and get physical proof of health screenings before committing to a purchase. Note that a Bernedoodle price won’t be lower than that of a purebred dog. The Bernedoodle cost may even be higher! Is A Bernedoodle Right For Me? Looking over this article, can you handle the Bernedoodle’s specific requirements? If so, this might be the mixed breed dog for you. Do you have one? Do you want one? Let us know below! Famula, T. R. (2006). Heritability and complex segregation analysis of hypoadrenocorticism in the standard poodle. Journal of Small Animal Practice, 44. Gerber, B. et al (2007). Increased prevalence of Borrelia burgdorferi infections in Bernese Mountain Dogs: a possible breed predisposition. BMC Veterinary Research, 3. Licht, B. C. (2007). Clinical characteristics and mode of inheritance of familial focal seizures in Standard Poodles. Journal of the American Veterinary Medical Association, 231. Lockey, R. F. (2012). The myth of hypoallergenic dogs (and cats). Journal of Allergy and Clinical Immunology 130. Marmor, M. et al (1982). Epizootiologic patterns of diabetes mellitus in dogs. American Journal of Veterinary Research, 43. Moore, P. F. and Rosin, A. (1986). Malignant histiocytosis of Bernese Mountain Dogs. Veterinary Pathology, 23. Ubbink, G. J. et al (1999). Familial clustering and risk analysis for fragmented coronoid process and elbow joint incongruity in Bernese Mountain Dogs in the Netherlands. American Journal of Veterinary Research, 60. Pederson, N. C. et al (2015). The effect of genetic bottlenecks and inbreeding on the incidents of two major autoimmune diseases in standard poodles, sebaceous adenitis and Addison’s disease. Canine Genetics and Epidemiology, 2.